There are many of us in this day and age who keep poultry. From the poultry farmer to the back garden hen keeper. If you have taken some birds into you home and have started to enjoy your own fresh eggs, it is likely that it is only a matter of time until you find out how addictive poultry keeping can become. All too often you find that two or three friendly hens will become six or seven. You may find yourself hankering for geese or ducks. And if you have the land, then why not? They are rewarding creatures. Fun to care for and you loose hours watching them. However, if you have fallen foul of this, then all too soon you will find yourself in the midst of an egg glut. Here is a basic article showing you all you need to know to arm yourself for this glut. If, like myself, you allow your birds a modicum of freedom you may occasionally find a well hidden clutch of eggs. Hens, ducks and geese all love to take themselves to the most inconvenient places to make a nest and hide their goods from us. My own tried and tested method of testing eggs for freshness is to float them in a jug of water, before cracking them and using them. Egg shells are porous and will take in water, and so I only do this immediately before I am about to use them. When eggs spoil the air sack expands inside the shell. When the egg is fresh it will sink to the bottom of the jug and lie upon it's side. When the egg is starting to age but is still edible, the narrow end of the egg will touch the bottom of the jug, while the wider end will be raised towards the surface. When the egg has spoilt the egg will float. The second way to check an egg for freshness is to crack it upon a flat plate (not a bowl). When the egg is fresh the yolk will be domed and full, and the egg white will lie thick and close to the yolk. In a particularly fresh egg you may even have a slight cloudiness to the white (this is caused by carbon dioxide that dissipates after the egg has been laid). If the egg is not fresh the yolk will be flatter and the white thinner and will spread over the plate. Eggs, surprisingly, can be frozen. Obviously if you simply try to put a whole egg into a freezer it is going to explode. Crack a single egg into an air tight container and freeze it. Once defrosted you can still fry it as usual. I'm not a fan of this as I feel they loose a certain something with freezing. If you are in the grip of an egg glut you are not going to be short of an egg for frying. This is my favourite way of freezing eggs. Simply beat your eggs to make a constant yellow eggy mixture. Pour into a freezer bag and put it into the freezer. It is worth remembering to write onto the bag how many eggs and what size is in each bag. This method is good for cooking. Separate your eggs and add the whites to one ice cube tray and yolks to another. One yellow yolk cube and two white cubes are equal to one medium egg. Whatever your chosen method, do defrost thoroughly before use. NB. it is worth noting that things may not rise quite as well with eggs that have been frozen. Also defrosted eggs may appear a little �sticky�, but this does not cause any problems with cooking. As many people now use goose, duck and even quail eggs in cooking it is worth noting that their overall volume can come into question within a standard recipe. As a rule of thumb try to remember that standard recipes use medium hen's eggs unless otherwise stated. A medium hen's egg should weigh around 55g. There are many tried and tested recipes for pickled eggs. I personally find you either love them or you hate them. Whilst the cooked boiled eggs are cooling, prepare the pickling liquid. Place all of the other ingredients into a saucepan, stir them together and boil them. Once the liquid boils, reduce the heat and let the liquid simmer for about 10 minutes. Remove from the heat and leave to cool to room temperature. Meanwhile, place the peeled hard-boiled eggs into a sterilised large jar (this can be done in the oven as for jam making but is better used cool). Once the pickling solution has cooled, pour it over the eggs in the jar and seal the jar tightly with the lid. Store the jar in a cool and dark cupboard for at least a month. The eggs will be ready to eat after this time. Of course, you can always make yourself the favourite of you neighbourhood and share them with you neighbours. Maybe you could consider selling your surplus at the gate. If you want to try this route have a look here for some advice. This is usually a breakfast curry but is cheap, quick and easy so useful for any time of day, traditionally eaten with paratha or chappatti but just as tasty in a roll or toast, or our favourite which is with jacket potato. You can use pretty mucvh any veg in this depending on what's to hand, the only essential really is some sort of alium. We find 3 eggs between the two of us is sufficient. Sweat the leeks in the oil until translucent. Add salt and chilli, incorporate. Sweat the garlic in the oil until translucent. Into each egg coddler/ramekin/teacup put a knob of butter, a small teaspoon of honey and a pinch of chilli powder or chilli flakes to taste. Add one or two eggs. Cover and coddle in simmering water until cooked to your preference. Eggs are also nice coddled over cream cheese and finely chopped ham, in which case aim to keep the yolk a little runny so that it all can be stirred together into a delicious mess before eating with toast. Season the yolks and add any herbs you wish to use. Melt a little butter in a frying pan and cook some sliced mushrooms. Beat the egg whites until they stand up in peaks, then fold into the yolks. Don't over-mix - you want it very fluffy. Tip the egg mixture onto the mushrooms, spread it out with a spatula and cook (on a fairly hot heat) until the bottom has set and starts coming away from the side of the pan. It should puff up a bit. Sprinkle the blue cheese on top, then put the pan under the grill until the omelette has puffed up and set, and the cheese has melted. chop onions and garlic, fry in a little butter until clarified. spoon on another amount of sauce leaving about a centimeter from the top. Place under a low grill for around 10 -15 mins. When the cheese just starts to brown take knife and gently ease a side away from one dish to see if the egg white has cooked. If is is looking cooked turn the grill up to completely brown the top. serve with hot buttered toast, heavily peppered. Feed to someone like BA and watch out for the yummy noises. I tend to serve this as an indulgent lunch or a starter. However, I have also served it in a large shallow dish with around 6 eggs as a main course, accompanied with cous cous. Try adding other things to the sauce to give it a different angle. I have used paprika in the past to good effect. make a basic white sauce ie melt butter, make a roux by mixing in the flour and heat gently, stir in milk little by little. assemble by cutting the sandwich into triangles, place the egg on the top and spoon over the sauce. 100ml Fresh squeezed lemon juice. 1. In a pan bring the lemon juice & zest up to a simmer, then allow to cool. 2. Whisk together the egg yolks & sugar in a bowl over a pan of simmering water until it is pale. Pour the lemon mixture into the egg and whisk until it thickens up enough to coat the back of a wooden spoon - you should be able to draw your finger through the mix without it running back together. Mix the poppy seeds through and then chill mix completely. 3. When the custard is very cold beat in the mascarpone. Churn and freeze. 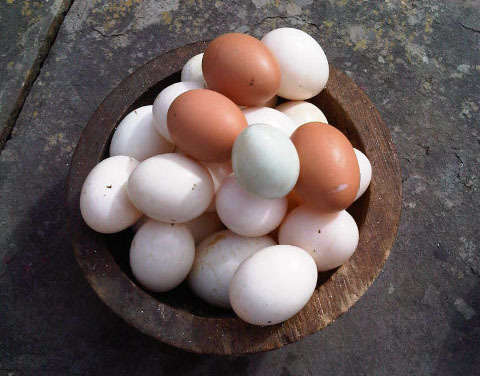 For more in formation on dealing with an egg glut have a look here, here and here.